Tomasi Studios (5 months ago) Inappropriate? rrkknight3 (11 months ago) Inappropriate? Yoshimi (2 years ago) Inappropriate? Gmeister11 (3 years ago) Inappropriate? Bagirra (4 years ago) Inappropriate? Not working files((( Not Downloading! BAD! Ukuotus (5 years ago) Inappropriate? Wow, very cool. Thank you so much for sharing this. thomasishp (6 years ago) Inappropriate? I say this, wow! This set is one of the best I have seen out there made for M4. Naru (6 years ago) Inappropriate? cool i have a few ideas for this providing its the figure and not clothing set thank you. aquatick (7 years ago) Inappropriate? Looks very, very impressive! Thank you so much! wendyvainity (7 years ago) Inappropriate? looks cool autofitted to Genesis using 3DU Jasmin with big boobies too! http://www.youtube.com/watch?v=rZstMOTFRs8 a silly video I did with your 3 characters plus Franz Munz's retargeted in iClone. blazeredflame (7 years ago) Inappropriate? Big thx for making this and putting it on share cg! Looks amazing. I am a long time Pred fan. I hope to one day make any characters for V4 or M4. lmant (7 years ago) Inappropriate? Fujiko (7 years ago) Inappropriate? Yosemite (7 years ago) Inappropriate? I just now got around to playing with this, and it's spectacular. Thank you Swidhelm, for this awesome gift to the Poser community. dwindt (8 years ago) Inappropriate? A very well done to you. Bernie666 (8 years ago) Inappropriate? Can't wait until you release your other predator projects you announced in the "Read me" file. darkwinterwolf (8 years ago) Inappropriate? I love it love it love it love it love it. it almost universal with V4 althought I had some troubles with teh body net but otherwise great F****** work. Make more!!!!!! abeman1376 (8 years ago) Inappropriate? Leamarie (8 years ago) Inappropriate? flavia49 (8 years ago) Inappropriate? LadySythe (8 years ago) Inappropriate? OMG THANK YOU!! I can't seem to make the Predator 2 for M2 work for any other figure and most other Pred freebies are just not quite right. This rocks! I can't wait to play with him! I've put another render in the gallery to show Swidhelm's marvellous work. meeeeeee (8 years ago) Inappropriate? ericjaja (8 years ago) Inappropriate? bebis99 (8 years ago) Inappropriate? I must admit I am quite impressed with the amount of careful detail I see in all your work, from armor to this. Thank you. Awsome work, thanks. Works well in DAZ; See my quick render in the art gallery. I use Winrar, no problem in unzipping. Stu (8 years ago) Inappropriate? Swidhelm (8 years ago) Inappropriate? Hey thanks all for your interest in this. For those having issues I used 7zip, which is free. Just google it. It's got a higher compression ratio that winrar or winzip. 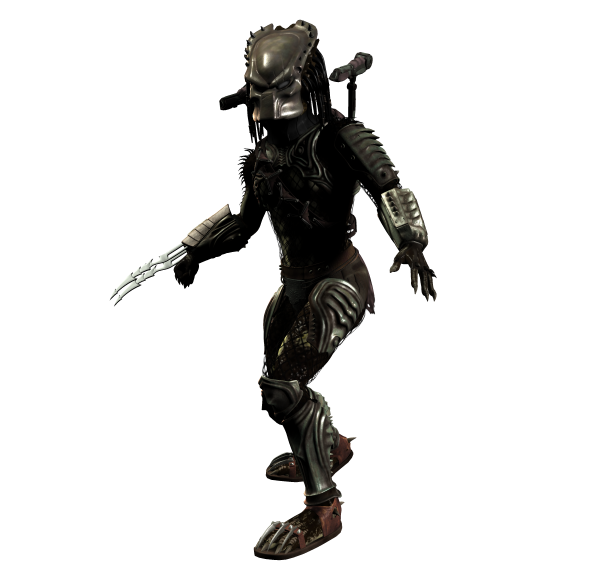 Also UltraBorg if you see this come find me on Renderosity or email me, and I can send you the Predator stuff. Rumpelstiltzkin (8 years ago) Inappropriate? I have "Stuffit" & still can't figure it out, 7Z ?? UltraBorg989 (8 years ago) Inappropriate? Looks amazing but I haven't been able to correctly download larger files from sharecg. The download always cuts off prematurely and I get a corrupt file. Any chance you could post this at an alternate download location? Jlgatch (8 years ago) Inappropriate? Awesome as ususual! Been hoping you'd have a new Predator coming out. Superb.......I am using him right now! Thank you for this fantastic share. Rogerbee (8 years ago) Inappropriate? First rate as always! To anyone having problems opening the download file, you need 7Zip File Manager, a free program that handles this format as well as zips and rars. Google and you'll find it. The armor and weapons are absolutely awesome. Especially the shoes of the integrated laser and liked it a lot. Super professional model. Only the last face morph is incomprehensible. Thanks again for sharing. I hope your model receives the respect of users who deserve it. like all your works, great. Thank you for the gift. Amazing work, thanks for this freebie!